You were brought to the hospital with severe injuries in your large intestine or colon that had damaged part of your colon. Doctors after thorough evaluation advised you to go for a surgical removal of your damaged colon. The procedure is called hemicolectomy. You have undergone a hemicolectomy surgery when you were in the hospital. Though both laparoscopic and open methods for this surgery are available, doctors decided to go for open surgical method for you. 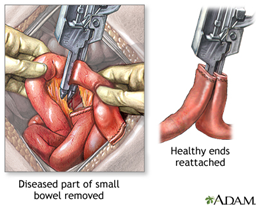 For open hemicolectomy, doctors made a 6- to 8-inch cut in your lower belly to find the part of your colon that is diseased.The surgeon then had put clamps on both ends of that part to close it off and then removed the diseased part. The two healthy ends of your colon were then sewn together. Do not drive or use other heavy machines if you are taking narcotic pain medicines. These medicines may slow your reaction time. Try getting up and moving around if you are having some pain in your belly. Press a pillow over your incision when you need to cough or sneeze. This may lessen the pain. Ask your doctor when you should start taking the medicines you stopped before surgery. Eat small amounts of food 5 to 8 times a day. Do not eat 3 big meals. Pain when you cough, sneeze, and make sudden movements. This may last 1 to 5 days. You may have problems with diarrhea. You feel sick to your stomach or you are throwing up a lot. Or, you cannot keep food down. You have not had a bowel movement 4 days after leaving the hospital. You have been having bowel movements and they suddenly stop. You have black or tarry stools, or there is blood in your stools. You are having belly pain that is getting worse, and pain medicines are not helping to ease your pain. You are short of breath or are having chest pain. There are changes in your wound from the surgery. Do not lift anything heavy for the first 6 weeks. Short walks and going up and down stairs are okay. Don't push yourself too hard. Increase your exercise slowly. For a speedy and long lasting recovery - combine positive dietary changes with the recommended medical care. Post-surgery, the medications can cause nausea. Taking medicines on a full stomach and incorporating 6-7 small meals/day instead of just 3 heavy meals can help with nausea. For a few days, after surgery, your doctor may recommend clear fluids and then graduating to soft foods like Jell, oatmeal, soup etc. till your intestine can completely handle regular food. Once solid food is reintroduced, you may experience diarrhoea, constipation, gas, bloating and discomfort. Introduce each food item one at a time. Here are some more tips that can reduce the uneasiness. Eat small portions of carbohydrates such as white rice, white bread, pasta. Fruits (without skin) such as - apples, pears, pomegranate and bananas are OK.. Thin dal, fish and eggs are OK. Choose foods high in Good Fat such as olive oil, peanut oil, walnuts, and flaxseeds. Avoid Dairy products like milk, cheese, yoghurt as they can increase tummy discomfort. Limit high Fiber foods such as fruits and vegetables, whole grains, whole wheat, beans, lentils. Limit vegetables from the cauliflower family like- cauliflower, cabbage, radish, broccoli. Limit on fruits like oranges, kiwi, and strawberries as these can irritate the intestines. Avoid highly Fatty, fried, greasy and spicy foods as fat cannot be easily digested post-surgery. Stay away from high Protein sources like red meat, organ meat as digesting these can be difficult. No Carbonated, Caffeinated and Alcoholic beverages as digestion of such drinks can be tough post-surgery. Keep in mind that your body and intestines will eventually heal and will be able to handle regular, nutritious and well balanced meals. If your complaints and discomforts continue, please reach out to your doctor.